Andy Puddicombe and Rich Pierson, co-founders of Headspace, want to help people become more productive by secularizing meditation. “We live in a culture where maybe we think the more we’re thinking about stuff, the more that we’re doing stuff, the more productive we’re going to be, but it doesn’t actually always work like that,” Puddicombe told CNBC. “Meditation offers us the ability to step out from that thinking mind and to see it in a different way so that we’re not so easily overwhelmed,” Puddicombe said. “Headspace is our way of helping society think differently about the health and happiness of the mind. There’s always been a focus on physical health. Our focus is on the health of the mind,” he said. Puddicombe and Pierson, who practice meditation regularly, say it has helped them make business decisions more skillfully by teaching them how to take a step back. “When we started, there was so much uncertainty and that was the hardest thing. … Resting in that uncertainty and being OK with it, I think that was the biggest benefit of regular meditation,” Pierson said. The two met in 2008. Pierson had just quit his job as an advertising executive and Puddicombe had started thinking about ways to bring meditation into modern life. Puddicombe had returned to London after spending years as a Buddhist monk traveling through Nepal and Myanmar, among other places. When they started setting up mediation events in 2010, the two learned a lot from each other. Puddicombe taught Pierson meditation and Pierson taught Puddicombe business. “Most people thought we were completely bonkers when we first started because mediation, especially in the U.K., was quite ‘out there’ at the time. There was a lot of resistance to the subject matter,” said Pierson, 35. The company is now based in Los Angeles. 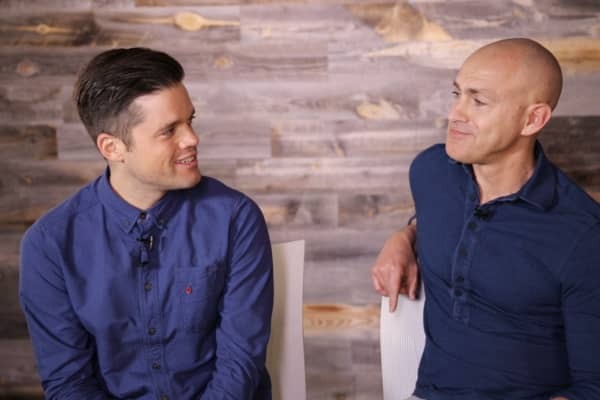 Rich Pierson and Andy Puddicombe, co-founders of HEADspace. Some of the resistance might have been reflected in the struggles Headspace encountered before its subscription app model. “We had $50,000 left and the event business was a terrible business model and we weren’t making any money,” said Pierson. The situation led him to consider alternative ways to make the company financially sustainable. That’s when Headspace pivoted to its current subscription model, something that Puddicombe wasn’t totally sold on at the time. “Before we even got to subscription, I was absolutely terrified of even going digital, never mind going to subscription. I genuinely didn’t believe that it could work,” said Puddicombe, 43. But Headspace didn’t have a lot of other options. “It was like if this doesn’t work, I don’t know what’s going to work, and we just went all in and put all of our money into building the subscription app,” Pierson said. The Headspace app launched in January 2013 and brought in more money that first month than Headspace had earned in the previous year, according to Pierson. Since then, the guided meditation subscription model has taken off. When the app relaunched in July 2014, it had 750,000 users, Pierson said. Today, he estimates that the figure is around 6 million people in 190 countries. Looking forward, the co-founders of Headspace just want to focus on their product and keep providing high quality content. “If you start worrying about what other people are making, I think you can get lost in the noise of it,” Pierson said. “Intention, it’s not just important at the beginning, it remains an important thing and is something to reflect upon on a daily basis,” said Puddicombe. Correction: This story was revised with Headspace correcting its figures for the number of countries, and users versus subscribers.